Do you want to increase revenue, teamwork and eliminate risk to protect your company? Miracle Resources Brand + Team = Revenue Program is your optimal solution! 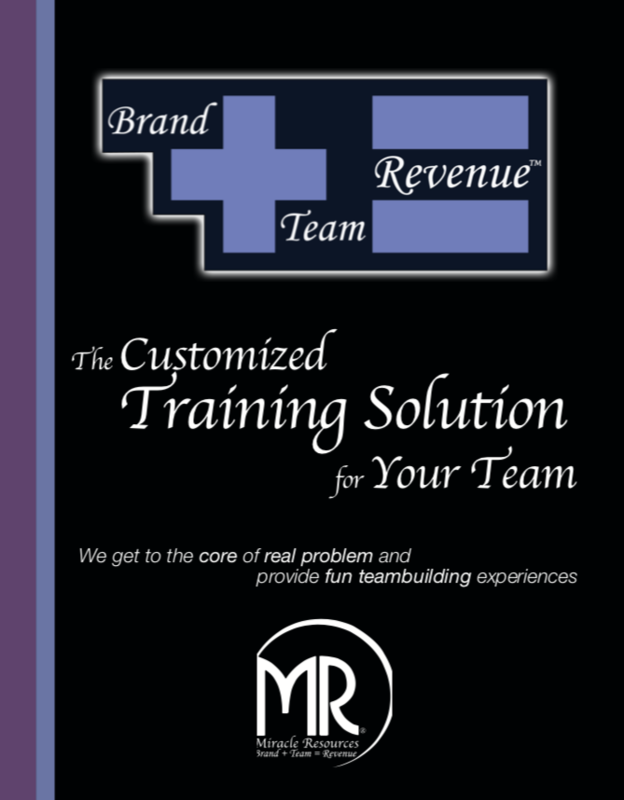 The Miracle Brand + Team = Revenue Program trains your team in fun, interactive and team building sessions. some clients use all at their conventions or retreats! Brands, Teams and Revenue grow as we take your team through a journey of learning the language of appreciative inquiry. The workshop includes interactive discussion and voluntary role-play to ensure all team members can effectively use appreciative inquiry in professional and personal communication. The workshop can include a team building culinary, sport or art challenge that helps them communicate to secure results. This workshop focuses on effective time management as the key to remaining stress-free. In this session, we have fun creating a plan of action on ways to reduce stress, focus on balance, and working smarter – not harder! Your team needs to read body language to work together, sell to clients, and deliver exceptional customer service. In today’s society reading body language can prevent violence and eliminate risk. Our training is based on research and best practices. The methods and role-plays used in our training surround the concept of “strategize then approach” and “first responder not first reactor”. Our facilitator incorporates the LEGO® Serious Play® method and materials to unlock hidden and new knowledge, break habitual ways of thinking, andimprove team communication. Teams perform a hands on project incorporating learned skills from this workshop. A communication plan is created through a team project focused on communication techniques and resources that grow respect & results. This workshop helps your team uncover talents that help them grow confidence. Teams report that this workshop helps them discover what breaks their confidence and how to silence those confidence-breaking triggers. Your team will be given confidence resources and participate in a discussion about the social media scenario “compare & despair” confidence killers. Your team will create a confidence plan of action that includes a time management strategy to grow confidence through balance. Teams create an innovative plan of accountability to build company culture. Teams can use your existing company culture campaign or create one in our workshop. Creating a culture of success and respect is an interactive training, which helps your team members identify their path to success. They are given the tools to understand how to foster success and respect in their workplace by Identify their personal, professional, and team goals. The team also learns how to create the culture needed to achieve each of these goals. Teams create an innovative plan of accountability to build the company’s culture. Team members discover and create their personal brand based on their talents and goals. A brand plan is created that elevates the team member and the company brand. MBTI testing & Success Coaching for all employees – this session helps team members unlock their potential, overcome obstacles and create appreciative inquiry. The personal branding books, “Discovering Your Dawn” & “Your Strategic Personal Brand” are given to all employees. This workshop is also a retreat that encompasses a visual shopping experience with creating of a Look Book,Brand Logo Design and One on One coaching session to create your Strategic Personal Brand. This fun and innovative training engages teams to use their strategic personal brand to help customers. Miracle service “customer service training” uses the power of appreciative inquiry and emotional intelligence to empower your team. This fun and innovative training engages teams to create a seamless customer experience. To create this experience you will adopt service standards. Develop team members strategic personal brand understand their talents and how to best serve customers. Our training is based on respectful communication to build relationships and identify customer needs. Using the power of appreciative inquiry and emotional intelligence to empower your team. This session uses gaming and team building to engage all five generations in today’s workplace and bonds the team by celebrating diversity! In this session, we show a successful team that bonds around their differences and celebrates each unique team member! Our client’s report: This workshop took our team from major conflict to greater understanding and respect for each other. The gaming and team building was fun and helped our team to bond and to listen to each other. In the past we did a fun activity but in this workshop our trainer helped us to get the core of the real problem we faced. The trainer helped us work together to solve our problem and become accountable. This program is crucial to your team so they are aware of their emotions and triggers while learning how to manage emotions. The resources provided in the program will help your team read body language and use respectful communication. Training for better team communication and results. Our workshop provides interactive learning through at team activity based on a food challenge. Team members love this activity and bond over food and a greater understanding of themselves and their teammates! Identifying it and stopping it! This team building session showcases the best practices in communication, mindset of success, and accountability! Miracle Resources Respect Team/Family Test is given as well as the Miracle Resources Individual Respect Test. These tests help the team member motivate for personal and cultural change. Our client’s report: Our trainers use stories that were anonymous and our team learned from each story on how to identify bullying and negativity. Our team members learned about their actions without being put on the spot, instead the trainers stories help them see what they needed to change to help the team grow. The best of organizational leadership and positive psychology is used to engage all attendees in new ways of handling problems. This session is interactive and provides one-on-one time with the session facilitator. Our client’s report: Leaders on our team are now using the resources to build our team through respectful communication and appreciative inquiry. Our turnover has decreased and we are increasing revenue! This workshop features interactive learning during a fun activity. A plan is created by each team member to use listening to understand, build relationships and respect team members and customers. ourselves in the stories. We now know how to fully listen and focus to prevent conflict. team members use creativity to create a personal plan to help the company market and brand to achieve goals. workshop we discovered this andnow we have a team effort to secure new clients. Have you ever wondered why you aren’t successful, no matter how hard you try? The truth is if you don’t uncover the secret to mastering your mind, body and spirit, you will never truly be successful. Kick off your Brand + Team = Revenue training experience with this critical PRE-TRAINING course led by Pam Glowski. you to forge new habits, relationships, disciplines and strategies that will increase the odds of your true success! This workshop helps your team members uncover their individual and team motivations. Our process is based on the research in the book “Your Strategic Personal Brand…The Truth & The Lies”. By uncovering why we are motivated and unmotivated we can use that knowledge to build long-term plans that achieve goals. This workshop can also feature meditation and an off site team experience. A fun and engaging training for novice to expert networkers. Team members participate in a mock networking and have fun learning about body language. Team members create a networking plan to showcase Confidence, Class and Character. If possible we host this training with a Wine Tasting Team building event called Sommelier for the day! Our clients report: We were tired of paying for our employees to attend networking events and we were not getting new business. After this workshop our employees learned to focus on the correct potential clients and use communication that engaged and intrigued potential clients. A workshop and coaching session for individual and team presentations. This workshop is used by executives and helps team members on all levels of public speaking. The workshop was created by a college instructor who travels the United States as a paid speaker. The workshop is fun because we explore thelies people believe about public speaking that kills confidence. We work with you to set your reticular activating system in your brain to take action on helping your audience with the credible and confident presentation you will learn to create in our workshop. Our clients report: The workshop and coach have helped our employees speak with confidence, class and character. Their presentations help us close deals and have increased our revenue. Power Presentations: How to excite an audience through Confidence, Credibility and Passion by Miracle Resources gives you Katherine Miracle as your success coach. Katherine is a paid professional speaker and winner of CBC magazine’s Best Speaker. Katherine teaches Introduction to Public Speaking at the University of Akron and Kent State University. Katherine has help students who once reported panic attacks about speaking. style and delivery of every speaker. See www.katherinemiracle.com and www.ratemyprofessor.com for testimonials. Teams are challenged to create new ways to generate revenue from existing products and services. The workshop is part 20% training and 80% team hands on project work. The result is a fun experience and a plan of action for generating revenue. Our client’s report: The revenue-generating workshop helped our team think outside the box to create more revenue. This workshop is designed for Individual or team coaching for managers who want to build a team that builds relationships and gets results. Sales Training Workshop is a team building session on how to sell and howto be the trusted advisor to teach and manage others to be successful in sales. This session can take a sales pro and someone new to the industry to a new level of marketing, selling and customer service. Miracle Resources has heard the stories of boring videos so we have the best lawyer who is fun and will answer questions of your team members. Seth Briskin, Esq. uses humor and provides a fun experience to prevent crisis in your workplace. If your company has a required presenter we can work with your chosen law firm or legal department. The prevention of harassment in the workplace is both an international and national concern. It is internationally agreed that sexual harassment is a form of gender discrimination and is recognized as a violation of human rights. Most companies give a packet of what not to do in the workplace but don’t often specify how important it is to avoid sexual harassment in the company, or how damaging it could to the parties involved. We use anonymous case studies to learn from and provide a positive experience on the importance of sexual harassment training, and how you can avoid the crisis in your workplace. This interactive session is fun for audience members because we look at what works and what is just social vs. professional. The creativity and wit that gets attention on Facebook and twitter can hurt you on LinkedIn. Our client’s report: Our employees can now navigate through what works and what can damage our company reputation. A team-building workshop based on a fun activity that creates a plan for the company. Team members are engaged in developing individual and team standards of success. This session covers workplace policies in order to prevent risks. This session is a fun and interactive way to engage and motivate positive standards set by the team to determine appropriate and legal workplace relationships, behavior, conflict management, workplace safety, emotional intelligence and social media etiquette. Our client’s report: After the workshop we saw our team members perform to a new level that impressed our management. This team-building workshop is based on an actual shopping experience. Your team learns by observing what helps customers fall in love with products/services. Our workshop then continues over a meal to discuss what was observed and learn the secrets so your team can apply them to your marketing campaigns. Our client’s report: Our employee’s love motivating customers and learning their needs since the workshop. In the past they hated marketing and upselling now they are listening and motivating with better results and increased revenue. Teams are challenged to create a charter around a fun event then using theskills they have developed in our workshop, each team or department is guided through our team charter process that leads to a GPS for success in their workplace. Our client’s report: Our team is now working together with a greater understanding of each other. We have clear goals, deadlines, and plans for acceptable behavior. As a team we created all of this in the workshop andwe are all engaged because our charter was created by us to help us. This offsite workshop is hosted as training with an experience. Our teams love escape rooms, horseback riding and doing a community project. The workshop uses the experience you choose to help the team create a brand-building plan of action. The result is increased revenue as the team is engaged in elevating the brand through teamwork. To increase revenue and build your customer base you need creativity and true customer engagement. Audience members must be ready to participate and have fun! Our client’s report: The team is now using the brand-building plan of action and has increased the level of communication. members understand our brand and feel they are accountable for the brand. Katherine Miracle, Brand & Team Building Expert, will work with your team to get to core of the real problems your teams face in an interactive training. Kayla Miracle, Brand Stylist, will work with your team members on a professional makeover to present their best selves. Kayla will enhance their personal/professional style while elevating your company brand. Our clients report: The team is now using the brand-building plan of action and has increased the level of communication. This workshop educates your team on what is unconscious bias and how you can stop bias from putting your brand, team and revenue at risk. Halo vs. Horn: The bias that a person will always succeed and produce great ideas vs. the bias that a person will always fail. Perception bias: Stereotyping certain groups of people and makingassumptions leading to not being objective about certain groups. and opinions. This causes them to lose part of their identities and causes organizations to lose out on creativity and innovation. This team workshop will help the team create a strategy that engages appreciative inquiry, Customer Service and best practices to provide training that protects your brand, team and revenue.